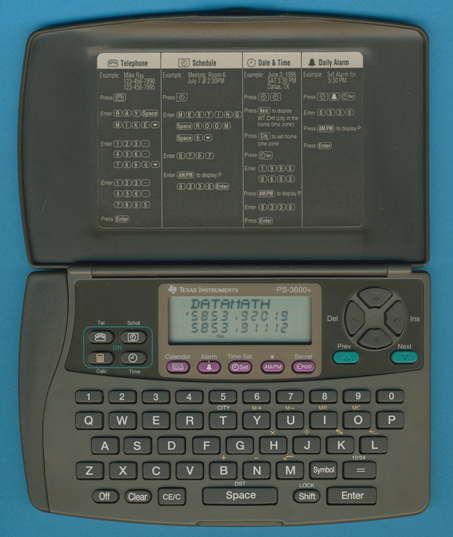 Size: 3.5" x 5.6" x 0.55"
The PS-3600+ Databank stores like its predecessor PS-3600 about 500 names and numbers in a small package with a protection lid. The display of the PS-3600+ consists of one line for alphanumeric characters and two lines supporting only numbers. The next evolution of the PS-3600+ was the PS-3660i with identical memory or the 40k Byte version PS-3960i. Dismantling this PS-3600+ Databank manufactured in June 1995 Compal Electronics in Taiwan reveals a big surprise! The printed circuit board (PCB) is populated with just one major component in Chip-on-Board (COB) technolgy. This Application Specific CPU integrates not only the program memory and display drivers but even the data memory with 8k Bytes capacity. The memory capacity was later expanded to 32k RAM, don't miss the successor PS-6100. Production of the PS-3600+ Databank was shifted within a few months to Thailand. We know products manufactured as early as October 1995 in Compal's Thailand facility. The design of the PS-3600+ fits neatly with the PS-2000 and PS-2400+. © Joerg Woerner, November 17, 2002. No reprints without written permission.